The joint initiative of the Forestry Department of FAO and the National Forest Programme Facility aims to assist countries to address emerging policy issues related to forests and climate change. The initiative seeks to integrate climate change considerations into national forest programmes (NFPs) or forest policy frameworks. To date, the approach developed and presented in “Climate Change for Forest Policy-Makers” has been introduced to a number of countries that can use it as a frame of reference for their national level processes. This document is a key part of the efforts by the Forestry Department of FAO and the NFP Facility to address emerging policy issues related to forests and climate change. It seeks to provide a practical approach to the process of integrating climate change into NFPs. The aim is to assist senior officials in government administrations and the representatives of other stakeholders, including civil society organizations and the private sector, prepare the forest sector for the challenges and opportunities posed by climate change. The critical role of forests in climate change mitigation and adaptation is now widely recognized. Forests contribute significantly to climate change mitigation through their carbon sink and carbon storage functions. They play an essential role in reducing vulnerabilities and enhancing adaptation of people and ecosystems to climate change and climate variability. In many countries, forest policies and climate-related policies are the competencies of different sections of government and involve different groups of stakeholders and experts. The exchange of information across administrative and sectoral boundaries on issues around forestry and climate change is often limited. In many countries climate change issues have not been fully addressed in national forest policies, forestry mitigation and adaptation needs at national level have not been thoroughly considered in national climate change strategies, and cross-sectoral dimensions of climate change impacts and response measures have not been fully appreciated. Countries’ actions in mitigation and adaptation could have major implications on forest policy and on sustainable forest management. 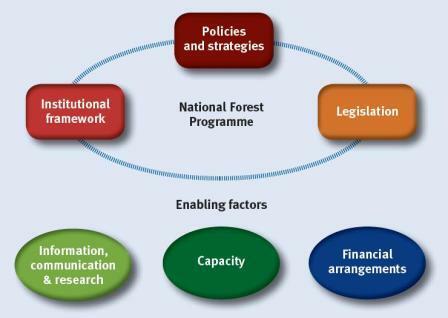 National forest programmes (NFPs) are frameworks commonly agreed by countries for developing and implementing comprehensive forest policies in pursuit of sustainable forest management. Without properly addressing and integrating climate change issues into their NFPs, it is unlikely that countries will achieve sustainable forest management. The approach presented in Climate Change for Forest Policy-Makers is the outcome of a thorough consultative process with active engagement of countries and experts. One of the challenges of dealing with climate change is the rapidity with which new information is developed. Another is the sheer volume of information and material being produced. A web portal has been created listing basic information, case studies and useful tools related to climate change for forest policy makers - section 4 in the publication. Go to the site. The foundation of the approach was created through findings of national workshops in four pilot countries in 2009 and 2010. The findings as well as the approach under development was then discussed in an expert meeting organized in Rome, Italy in September 2010. This meeting at FAO Headquarters involved national and international forest policy and climate change experts, including a participant from each of the four national stakeholder workshops. More information from the expert meeting can be found from Programme expert workshop 20-21 September 2010, List of Participants and Workshop report. This approach is designed to assist forest policy makers to develop strategic goals and respective actions to integrate climate change into forest policies and strategies, legislation, and institutional framework. It also suggest ways to improve and develop the so-called enabling factors: forests and climate chage-related capacities, financial arrangements, research and information and communication systems. Countries can use the approach to facilitate stakeholder dialogue on elements of climate change, as well as related challenges and opportunities, that should be addressed in the NFP or the forest policy framework. Countries that have not yet identified priority actions in the forest sector for climate change mitigation and adaptation may use the approach to develop a national forest and climate change strategy. Countries that already have a forest and climate change strategy or a REDD+ strategy may use the approach to identify and make needed adjustments to their national forest policy framework to facilitate strategy implementation. Countries may use the approach as a way to check that existing strategies in relevant sectors are comprehensive and consistent, and adequately take into consideration stakeholder interests and priorities. The approach can also be used at sub-national levels for similar purposes. The approach outlined in Climate Change for Forest Policy-Makers provides a general frame of reference for the integration of climate change considerations into NFPs or forest policy frameworks. Each country will have to adjust the approach and decide how to carry out best the relevant actions, taking into consideration its particular needs. To date, the approach has been benefited of experiences from the four initial pilot countries and four country and regional workshops organized to present and review the draft guidelines. To prepare and guide the discussion in the workshops, a background analysis of the major challenges and opportunities climate change poses for the forest sector and the related policy issues has been undertaken. The workshops have brought together relevant stakeholders to discuss the findings of the background analysis, share experiences, identify gaps and areas of collaboration. The workshops have also proposed respective responses, and analysed the changes that may be necessary in the policy and institutional framework to adopt a coherent approach to climate change within relevant sectors. More information on the processes in countries (Cambodia, Paraguay, South Africa, Tanzania, Zambia, Ecuador and Peru) as well as in the regional workshops (Near East, Central Africa) is available below. * Please note that the agenda in the Near East workshop included also other topics than integration of climate change considerations into the NFPs. This is reflected in the workshop report.